The Smart Part Component System consists of several new visual and non-visual components. The purpose of the Part Search Grid is to display all of the parts that match a specified search condition and allow them to be added to the order in a fast and efficient manner. 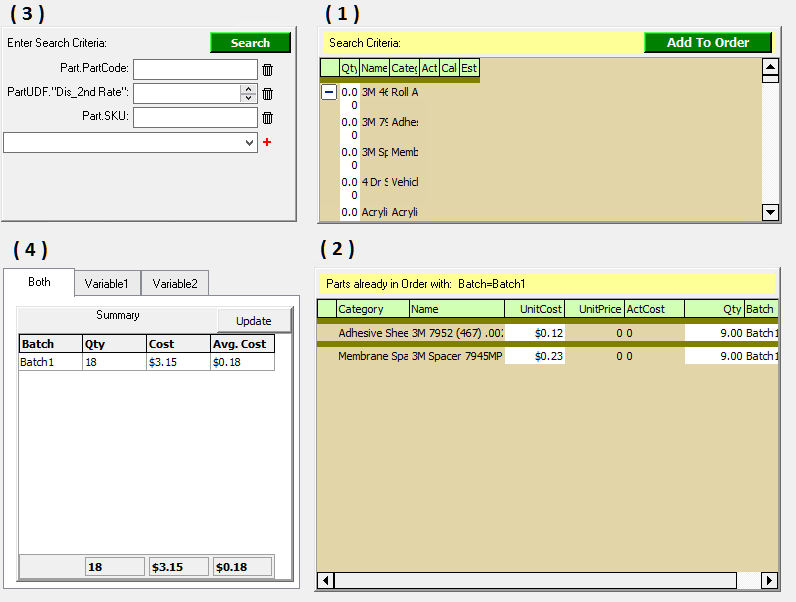 The purpose of the Part Filter Grid is to display all the parts already on the order that match a given filter condition. It also allows the user to adjust quantities and cost for parts already on the order. The purpose of the Part Search Builder component is to build out a list of search boxes to specify the search criteria used in a Part Search Grid. One or more search properties are specified and the Part Search Builder component builds out a series of input boxes with labels for the user to enter search criteria. The purpose of the Part Summary is to display a summary of the total quantity, cost, and price of items in one or two Part Search or Part Filter Variables. A new type of variable, the Part-Search-Variable (PSV) provides the data and functionality necessary for the part search system to work. The PSV is used by the Part Search Grid and the new CFL functions. A new type of variable, the Part-Filter-Variable (PFV) creates a filtered view of the parts on a line item. The PFV is used by the Part Filter Grid and introduces new CFL functions. A new type of variable, the Part-Summary-Variable (PSumV) provides a summary from one or more PartFilter or PartSearch Variable. The PSumV is used by the Part Summary component and introduces new CFL functions.